I can’t tell you exactly when I met Zach Morris, but as long as I can remember he has been my son Wil’s best friend. Zach has become family and is now another one of our amazing employees. 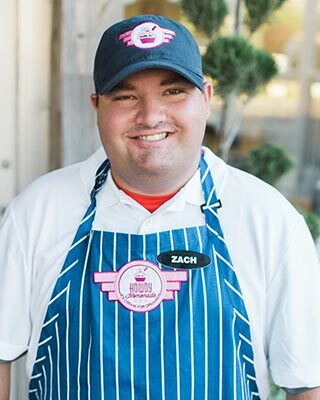 When we dreamed of opening Howdy, we knew we needed Zach to help us. “A friend to all.” This is the best description I can think of for Zach. I remember the day his Uber driver came in to wish him a Happy Birthday. And when I am fortunate to work with Zach, I always see customers who’ve come in just to see Zach. Young and old stop by to chat sports, life, and ice cream with Zach. Along with his love of people, he is always sincerely concerned about making the store a better place to be and helping his co-workers to be better. Thanks to Zach for the many hours he puts into making Howdy a happy place. My name is Zach Morris and I was born on July 23rd, 1993 in Salt Lake City. I have grown up in Sugar House, I graduated from Highland High School in 2012 (Go Rams!). While I was in high school, I had the chance to be a manager for the football team in 2010 when they won the State Football Championship. My junior and senior year I was on the lacrosse team. After I finished high school, I completed a two-year service mission at the Bishop’s Central Storehouse. Serving at this facility gave me the opportunity to help different parts of the country and world that have been devastated by natural disasters. I met a lot of amazing people and learned valuable lessons. In my family I have my parents and a younger sister. This last summer my family got a new puppy, his name is Stuart and he is a cinnamon colored golden doodle. I enjoy playing with him and teaching him new things. My hobbies are sleeping in, social media, and sports. I am always the first to like anyone’s post! I am a sports fanatic and love to watch and attend sporting events. My favorite teams are: Utah Jazz, Tennessee Titans, and Utah Utes. While on family vacations, I love to go and visit the nearest sporting stadium or arena. I love working at Howdy and seeing people from my neighborhood. I have learned a lot of new skills and met lifelong friends. My favorite ice cream flavor at Howdy is Cookie Dough.